Las actualizaciones automáticas me han jugado una de las buenas. Mañana tengo que estar 5 horas en un curso de Innovación y se acaba de instalar el January Update de Windows 10, espero que todo funcione bien. Although Windows 10, shares much of its core with Windows 8, is very likely that some programs or drivers do not work correctly. In my case, what I find is that the drivers of Intel Galileo installer will not work. So the time comes to install the drivers hand. In the case of the Intel Galileo, to be recognised as a USB Device is sufficient to work with Arduino projects, however for more advanced projects it is necessary to use Galileo drivers. When I open the Device Manager, I can see in it that my device is recognised as USB Serial Device on COM 4 port. To update the drivers, I select this node, display the contextual menu and select Update Driver Software. In the wizard, select the option Browse my computer… and finally select the drivers from the path [$\arduino-windows-1.0.4\hardware\arduino\x86\tools\]. Where is this path given by the installation package that detail in my previous post. After you complete the wizard, you will see that the Driver is installed correctly. And at this time the Galileo it appears correctly in the USB category with the correct driver. A few seconds ago I was pulling my teeth with pliers, because I have different versions of Windows 10 Technical Preview in my development laptop and in my Surface Pro for demos . This may seems trivial, but it has already complicated me a lot. In previous versions of Windows 10 Technical Preview there are some features of WinRT apps which are not working (for me is build 9869). The good news is that these bugs have been fixed with the build 9879 and … my Surface Pro wasn’t updated. While my initial instinct was to deploy a new OS from scratch in the tablet, I remembered that a while ago I came to this link where they described How to set the frequency in which you receive the updates of the OS. 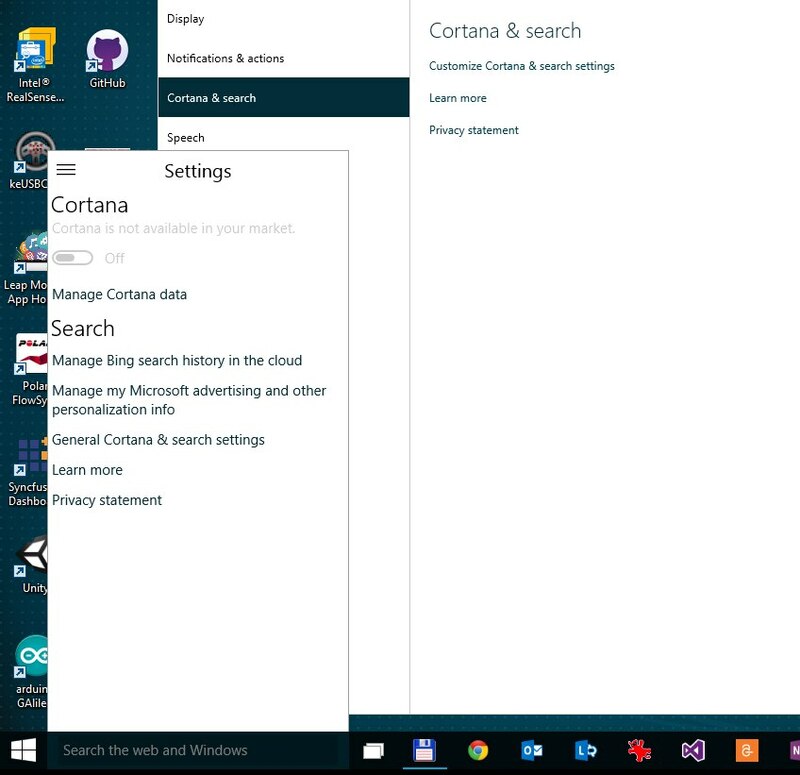 The beauty of this option is that automatically installs all new versions of Windows 10 Technical Preview which is released and makes an upgrade ended that it works very well. If you are also a craving and don’t want to wait at 03:00 AM to the OS update only, because the “Install Now” option to download and update the OS. Hace unos segundos estaba arrancándome los dientes con unas tenazas, porque en mi laptop de desarrollo y la Surface Pro de demos tengo diferentes versiones de Windows 10 Technical Preview. Esto que puede parece algo trivial, me ha complicado bastante la vida ya que en unas versiones anteriores había algunas features de apps WinRT que no funcionaban (en mi caso en la build 9860). Lo bueno es que con la build 9879 esos bugs se han solucionado y claro … la Surface Pro no estaba actualizada. Si bien mi instinto inicial fue planchar el nuevo SO en la tablet, recordé que hace un tiempo llegué a esta página donde describen cómo definir la frecuencia en la que recibir las actualizaciones del SO. Lo bueno de esta opción es que instala automáticamente todas las nuevas versiones de Windows 10 Technical Preview que se vayan liberando y hace un upgrade in-place que funciona muy bien. Si además eres un ansias y no quieres esperar a las 03:00 AM a que el SO se actualice solo, pues la opción “Install Now” descarga y actualiza el SO. We also have a bonus which is the ability to convert VMWare images to images of Hyper-V.
Además tenemos un bonus que es la capacidad de convertir imágenes VMWare hacia imágenes de Hyper-V.
I’ve done an upgrade in my old Windows 8 Enterprise to Windows 10 Technical Preview. After this I get the annoying message asking me to activate Windows license. For me, everything should be allright, however the Product Key in my SO is my Windows 8’s one, so it is impossible to activate it in Windows 10. 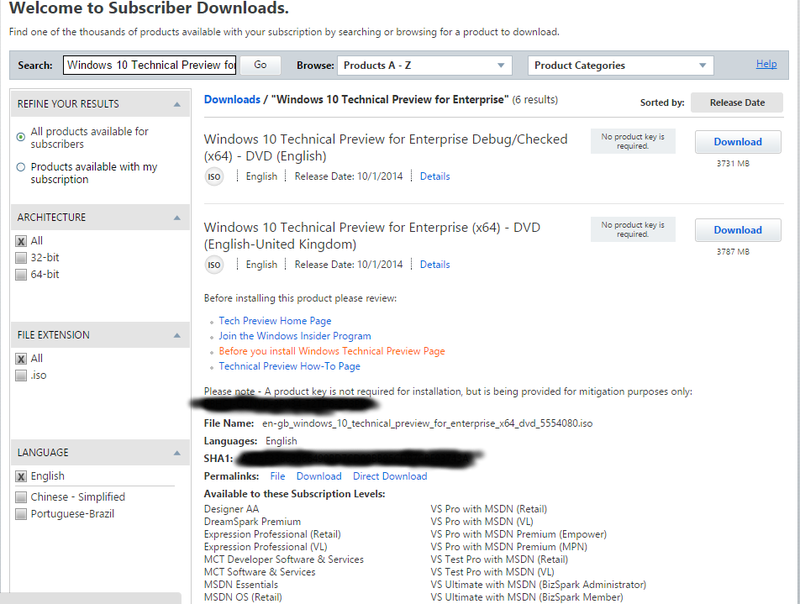 The funny thing is that if you use the MSDN to access your Product Keys, when you access the Windows 10 detail, you will see that it has no Product Key associated. That if, even though the message says “No product key is required” is placed in the “Details” section of the product. Si como yo has hecho un upgrade de tu Windows 8 Enterprise a Windows 10, seguramente te encontrarás con el molesto mensaje pidiendo que actives la licencia de Windows. El problema que tienes es que la activación está asociada al Product Key que usas con Windows 8, con lo que es imposible activarlo. Lo curioso es que si usas la copia de MSND, cuando accedes al detalle de Windows 10, verás que la misma no tiene Product Key asociado. Eso si, si bien el mensaje dice “No product key is required” la misma se encuentra en la sección “Details” del producto. Those of us who use the keyboard a lot, for sure we appreciate the options that we have with the Windows key combination + Cursor (up, down, right, or left) since Windows 7. When you perform one of these combinations, the window with focus is docked to a specific section in your desktop. I personally use it a lot and now using Windows 10, I realized that something had changed. Now in addition to docking to left and right options, we have additionals options, ie: once accommodated a window to the left, pressing Windows + Up and it conforms to a 4th part of our desktop. With 2 or 3 row combinations, we have interesting layouts.